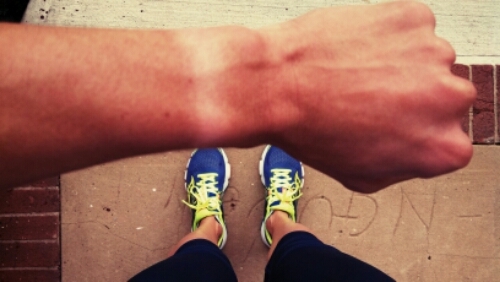 My Oiselle bio says that the piece of running equipment I cannot live without is my watch. For years I pretty much never took it off. The only exceptions were super fancy occasions, when I had to replace it with some bracelet that would stay right in the exact spot to cover up the insane tan line that became a permanent eye sore around my wrist. And then this winter I got a GPS watch for Christmas. I didn’t want to wear it all of the time and become overly obsessed with pace on all of my runs, but it’s really helpful for tempo days and long runs. So now I had to remember to change my watch for different runs. Somehow this transitioned to only putting a watch, one or the other, on for runs, and taking it off when I was done. Last week at practice the inevitable happened. I forgot my watch. At first I hated it. I felt naked and vulnerable, wondering how I was going to keep track of my workout. But then I realized how ridiculous that was. I train with a team. We do the same warm up loop for every workout, all of our intervals are paced and timed by the coaches, and everyone else has a watch so if I really need to know I can just ask. Not having a watch was actually kind of nice. Nice as it was, I know that a workout is not really the time you want to ditch the watch. Being able to hit certain times is actually pretty important for this sport. But when so much of what you’re doing is focused on times and paces, it’s too easy to get caught up in the numbers and forget to listen to your body and enjoy what you’re doing. I’m guilty of it. I know that training means there’s mileage to hit and paces to maintain, but I’ve lived here long enough to know the loops I have to do to get the mileage in, and my body knows the pace it needs to recover from a workout without doing a run full of junk miles. So today I intentionally ditched the watch and ran naked, and it felt pretty good! I should also partially credit the good feeling to a new pair of shoes and my Oiselle Lesley Knickers and Flyer Jacket for keeping me warm and dry despite the wind and drizzly rain. Maybe if I do this a few times when the sun is out I can even get rid of the permanent pale bracelet I’ve been wearing. Speaking of sun, next up for me is a trip to Palo Alto for the Payton Jordan Invitational 5k! Check out an awesome meet for some NJNYTC and Oiselle action!